Particulate matter can be generated through several processes. Formation processes determines the size distribution of the particles. The size distribution gives us important data about the fate of the particles. Composition of the particulate matter includes forensic about their actual sources. The aim of this study is to determine the impact of composting process to laboratory indoor air quality in close proximity to composting process. For this purpose, sampling was conducted at two different points; one of them wass inside the laboratory, whereas the other one was in the composting facility. A low volume cascade impactor was used to collect particulate matter according to their sizes. The impactor was operated for one week at each sampling point. Particles of 10 µm was dominant in the composting facility. The dominant particle size was 5.8 µm inside the laboratory. Particles were ultrasonically extracted in deionized water in order to determine ion concentrations. Ions were quantified in Dionex ICS-3000 ion chromatograph. Ca+2, NH4+ and SO4-2 were investigated. NH4+ and SO4-2 had highest share in the finest size fraction at both laboratory and plant. Particles of 3.3 µm were enriched with Ca+2. Biological decomposition products were effective in the ionic composition of the fine particles, whereas mechanically generated dusts formed the coarse particle fraction. J. H. Seinfeld and S. N. Pandis, Atmospheric Chemistry and Physics: from air pollution to climate change, 2nd ed., Berlin, USA: Wiley, 2006. ISNAD Saral, Arslan . "Indoor Particle Size Distribution and Ionic Content of Particles in the Laboratory of ISTAC Composting Facility". 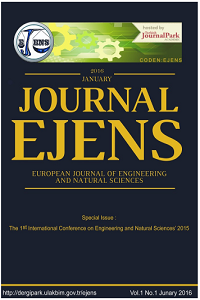 European Journal of Engineering and Natural Sciences 2 / 1 (February 2017): 49-55.